....The orchestration is beautifully detailed and the vocal writing creates a soaring line that carries the listener right through the vast canvas of the cycle." ....(the) ability to craft a score that was so intense, thick, and full of rich and challenging parts for every individual instrument..
and, at the same time, one that the average patron with little musical background can embrace." ...Dedicated to Gustav Mahler, this is passionate music on a grand scale – a modern day Song of the Earth." ...The core of these lyrics is their sheer, stark elegiac power reminding me of how I felt the first time I heard Rilke's Duino Elegies." Andrew Webb-Mitchell would like to extend his gratitude to the Landesamt für Denkmalpflege und Archäologie Sachsen-Anhalt for granting permission to use Juraj Lipták’s wonderful image of the Nebra Sky Disc. The Inspiration of Night was premiered at the Tianjin Grand Theatre in October 2012 by Sir Mark Elder and the Hallé Orchestra. 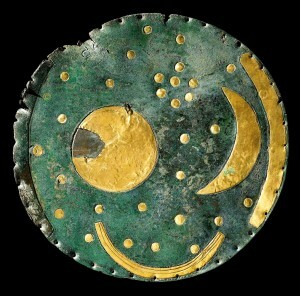 The text takes us back to the dawn of time suggesting the awe and wonder of primitive man as he gazed towards the heavens, referring particularly to a bronze-age artefact, the Nebra Sky Disc; an amazing and beautiful example of early humanity’s craftsmanship and skill in astronomy. The disc was found in a cache of bronze goods, including axes and daggers, in a Bronze Age site at the top of a mountain, the Mittelberg. It is thought that the site would originally have had a good view of the skies and the horizon all around, and might have been used as an observatory. The astronomical information on the disc is particular to the latitude of the location where it was found, so it is likely that the disc was made for and used in the site where it was finally hidden. It has gold-leaf appliqués representing the sun, the moon, and the stars is the oldest visual representation of the cosmos known to date. A cluster of seven dots has previously been interpreted as the Pleiades constellation as it appeared 3,600 years ago. The explanation of the disc’s purpose sheds new light on the astronomical knowledge and abilities of the Bronze Age people, who used a combination of solar and lunar calendars as important indicators for agricultural seasons and passage of time.